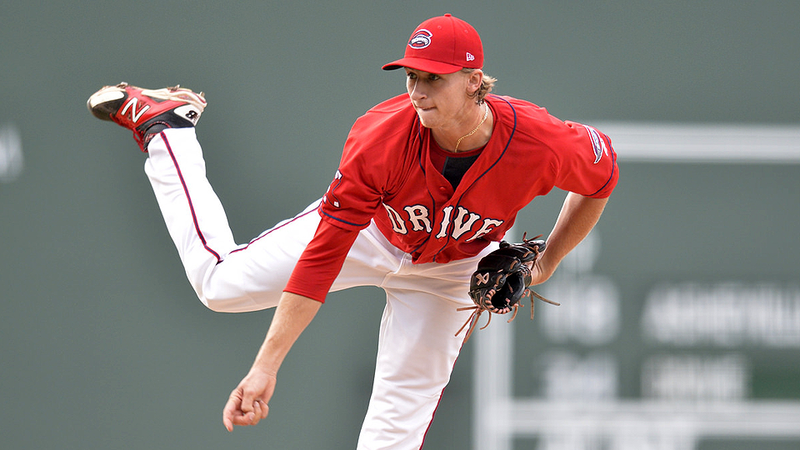 Red Sox prospect Michael Kopech, the team's No. 2-ranked right-hander, was diagnosed with a broken hand after getting into a fight with a teammate, according to reports. Kopech, 19, had a cast on his right throwing hand Tuesday at Boston's JetBlue Park in Fort Myers, Florida, according to WEEI. The 6-foor-3 starter engaged "in an altercation with a teammate recently," the report said, adding that Red Sox general manager Mike Hazen indicated the team would handle the situation internally and come up with a treatment and rehab plan. "It's disappointing. It's very disappointing," Hazen told The Providence Journal, which described the injury as a "small fracture." The Journal said Kopech fought with his Spring Training roommate several days ago, and Hazen said the club doesn't yet know the extent of the fracture. "It was stupid," Hazen said. "He's going to have to grow up, obviously, with the things that have happened so far. He's got a long road to go to get to the big leagues. He obviously has a ton of potential." Kopech, Boston's No. 5 prospect, was the Red Sox's first-round pick in 2014 but missed part of his first full season last summer after he tested positive for a banned stimulant and was given a 50-game suspension in July. "He's got a long way to go," Hazen added. "These types of things, you don't want to put more barriers in front of you than playing professional baseball already presents to you." Hazen said the club is awaiting more details on the fracture before they set a timetable for the righty to return. Kopech hasn't pitched since July 12, 2015. "It depends on the severity of the fracture and if we have to do anything with it or not," Hazen told the Journal. "Right now we're unsure exactly. There's a wide range of time frames depending on what we have to do. We don't have those answers yet." He appeared in 16 games with Class A Greenville, going 4-5 with a 2.63 ERA and 70 strikeouts in 65 innings in the South Atlantic League. He walked 27 and allowed just two home runs. The Mount Pleasant, Texas, native, who turns 20 next month, appeared in eight games his first season in 2014 before earning Sally League All-Star honors last year with the Drive. He was also the league's Pitcher of the Week last April 27.